Magnus Chase, a once-homeless teen, is a resident of the Hotel Valhalla and one of Odin's chosen warriors. As the son of Frey, the god of summer, fertility, and health, Magnus isn't naturally inclined to fighting. But he has strong and steadfast friends, including Hearthstone the elf, Blitzen the dwarf, and Samirah the Valkyrie, and together they have achieved brave deeds, such as defeating Fenris Wolf and battling giants for Thor's hammer, Mjolnir. Now Magnus faces his most dangerous trial yet. His cousin, Annabeth, recruits her boyfriend, Percy Jackson, to give Magnus some pointers, but will his training be enough? Loki is free from his chains. He's readying Naglfar, the Ship of the Dead, complete with a host of giants and zombies, to sail against the Asgardian gods and begin the final battle of Ragnarok. 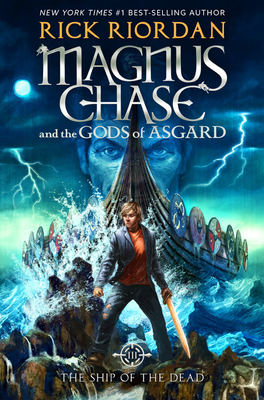 It's up to Magnus and his friends to stop him, but to do so they will have to sail across the oceans of Midgard, Jotunheim, and Niflheim in a desperate race to reach Naglfar before it's ready to sail. Along the way, they will face angry sea gods, hostile giants, and an evil fire-breathing dragon. Magnus's biggest challenge will be facing his own inner demons. Does he have what it takes to outwit the wily trickster god?